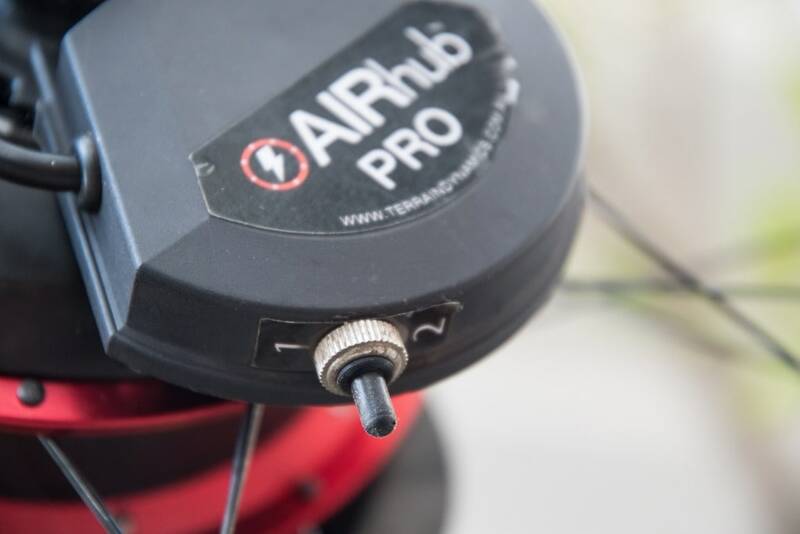 Last year about this time I tried out the original AIRhub while down at the Tour Down Under. That product is essentially a front wheel that provides resistance that you can control from your smartphone via Bluetooth Smart. It has a bunch of different modes, including some that pair to your power meter and heart rate sensors via ANT+. In effect, the wheel can apply enough wattage resistance to make you cry on even the flattest and busiest of pedestrian/bike paths. Or, to make you feel like you’re throwing down 300w when you’re actually biking next to your 8 year old. Roughly. 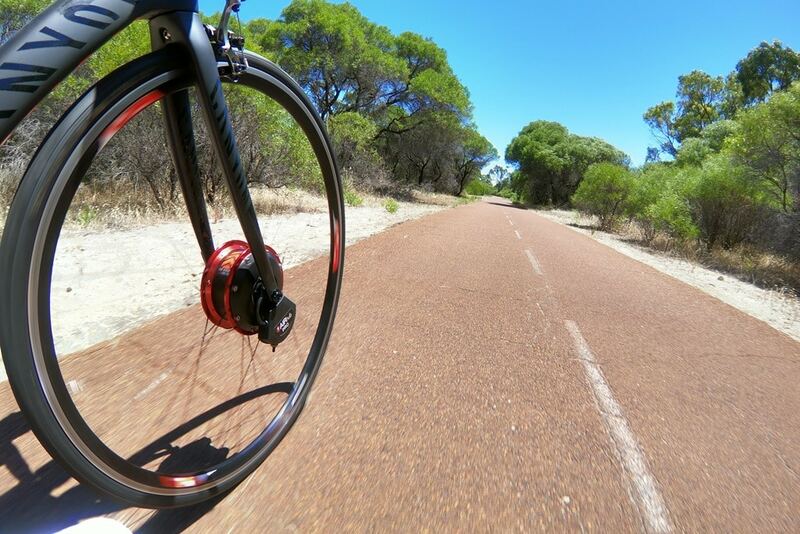 This year though upon my return to Australia I got to give their latest product a whirl – the AIRhub Pro. Now you may be thinking that with the ‘Pro’ moniker comes even more connected goodness, and probably a bigger price tag. But you’d be wrong. In reality, it has no connected anythingness, and it’s actually cheaper. Yet I think it’s actually better. But first, let’s step back a bit. On with the text and photos! The first thing you should probably know about the AIRhub Pro is that it doesn’t actually use air for anything. Fake news, I know, but the name at least sounds cool. Instead, in order to provide resistance, the wheel uses electromagnetic braking within the hub. Except, it doesn’t really feel like manual braking. Rather, it’s more of just a slight questioning of yourself if you’re working harder than you should. Unlike the original AIRhub, the AIRhub Pro doesn’t have any connectivity to your smartphone to configure it for variable resistance. Instead, it has a simple switch on the side. That switch has three positions: 0, 1, 2. Within the middle (0) position, it’s off. Almost no resistance is applied here, but it’s not quite 0w either (see chart in a second). 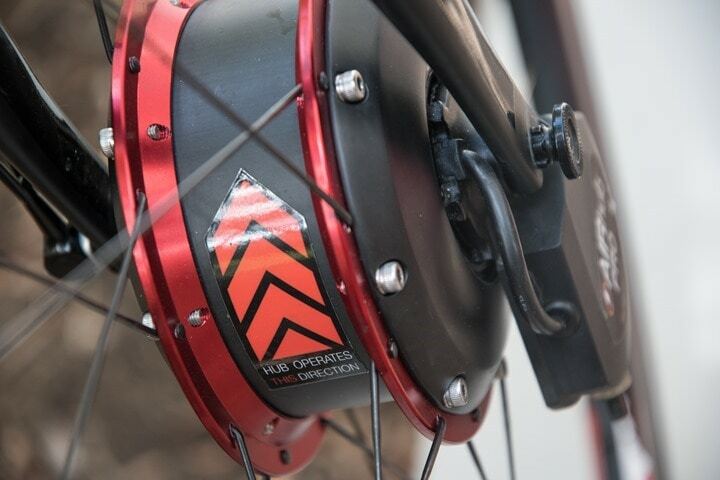 Whereas in the #1 position, it applies 1-watt of resistance for every 1KPH of your speed. Thus, if you’re going 10KPH (6.2MPH), it applies 10w of resistance. If you’re going 30KPH (20MPH), it applies 30w of resistance. Make sense? But what if that’s not enough? Then you can go to the second setting, #2. This setting doubles-down on the wattage, and provides 2w of resistance per 1KPH. So at 10KPH (6.2MPH) you’d be getting 20w of resistance. And at 30KPH (20MPH) you’d be getting a whopping 60w of resistance. The first scenarios is if you’re riding with someone who simply can’t throw down your wattage. This allows you to add additional wattage to even the playing field a bit, and thus ideally keeping you together for rides. The same concept also applies to group rides too. Can’t find a fast enough group? No issue, just apply more resistance. The company says some of their pros even use it to fulfill ‘sponsorship requirements’, which is a fancy way of saying ‘to ride with regular slow people at events’. You know, like that time this summer I rode with Jens Voigt at a media event on what were basically glorified beach cruisers. In all seriousness though – back when both The Girl and I were concurrently training for Iron-distance events, this would have been awesome. The #2 switch probably would have put us pretty close to the same ballpark within each other for most riding. The second scenario is less obvious, but more useful depending on where you live. It’s the ability to ride on shared bike paths and other low-speed locations, but with legit wattage. Any competitive cyclist/triathlete knows the pain of trying to get a workout in on a shared bike path. Either because that’s the only safe locale, or just because it happens to connect you to better roads. I did exactly that last week, where I took out the AIRhub on some local bike paths and enabled the wattage. I was still able to get a fairly legit workout in, staying in the 250-280w range on twisty and turning paths (complete with sand). It’s those type of places that the company also notes their pros tend to use their products around. Not everyone spends the full year on Mediterranean islands with beautiful training roads. Now, on the site the company also talks about using the device akin to a weight vest – just leaving it always on and always providing a bit of resistance. And that’s certainly something you could do. But I’m less convinced about the practical benefits of that. In my opinion, if you’ve got the roads and friends to ride fast and hard, you should do so as part of a regular training diet – no wheel required. But if you lack those two things, then this does indeed provide a good substitute. This section will be relatively short, since there’s only so many words I can use to describe going slower. In my case, I borrowed a wheelset from them about two weeks ago. It was sorta a perfect timing type of situation in that my bike’s regular wheelset had to be repaired, and the AIRhub crew wanted me to try out their latest wares. So I borrowed a wheelset from them to poke at for a couple weeks. It goes back tomorrow, as my wheels returned a few days ago. The first (and only) thing you need to do is hit the switch from ‘0’ over to either ‘1’ or ‘2’. In my case, I started with ‘1’, and then moved up from there. At first you might not actually notice it. Which isn’t to say it’s not providing resistance – it most definitely is. But like a lobster getting slow boiled in a pot, you don’t realize it when starting from zero. Rather, it just feels a little bit out of place harder. As if you’re not fit. For my first ride portion, I used some meandering paths along the beach. On this weekday morning, they were practically empty. However, in the evenings and on a weekend they get packed with slow-moving pedestrian, canine, and cycling traffic like a clam bake. Not to mention it has sand on the path, reducing the speed I can take any corners. Despite this, I plodded along and once switched into the #2 setting, I was getting a legit workout in on these paths. The downside though? That switch isn’t reachable from the handlebars, or any other way that I can figure while riding. I suppose if you were one of those crazy UCI Indoor Competition cyclists, you’d find a way to still pedal and access it, but it was just out of reach for me (and I didn’t want to keep on trying it either). If you’re unsure, try accessing your quick release skewer while riding. Not bright, right? Now I can’t blame them entirely here, but it is a downside nonetheless. Obviously, their non-Pro model includes the ability to change the resistance applied from the handlebars via smartphone. Back to riding it though – it felt fine and natural. It didn’t feel like I was holding the brakes on my handlebars. Rather, I just felt…slower. Sorta like a headwind. You question yourself a bit and wonder why you’re slower. Which, ironically enough was exactly what happened the next day when I went out for a longer ride. I left the neighborhood and just as I was doing that two cyclists cruised by. They were well-equipped road cyclists with all the proper equipment trimmings, just as you might see in any group ride. We were apparently going in the same direction, so I figured I’d ride along with them. Except for some reason it felt like they were throwing down serious wattage on what was clearly a casual ‘top of the morning’ pace. While one shouldn’t judge a book by its cover, neither of these two guys looked to be magically a pro cyclist, thus, I couldn’t figure out at first why I was having trouble holding on with them. And then I realized it: I had left the wheel on #2 from the day prior. Basically, I was getting #2’d on. Then came the only challenge: Turning it off. Either I’d drop off the back to fully stop my bike and turn it off, or, I’d suffer till the next light. Eventually, I suffered through to the next light, but by then they slid further away from my grasp. Still, in many ways, it perfectly illustrated what the system can do, even if unintentionally so. Of course, all this anti-power comes at a price, and a steep one at that. The AIRhub Pro sits at $1,000USD, which is pretty darn pricey. But at least that’s cheaper than the original connected AIRhub, which is $1,550USD. That version though comes with a Quadlock case kit setup (about $50-$70 in value), as well as a 4iiii Viiiiva (another $70-$80 worth). And thus, is fully controllable via phone. It can provide resistance automatically based on your heart rate or power for example. It’s super cool tech. But I think for most cyclists, the limiter is really the phone piece. Almost everyone carries a phone with them cycling, but most people in this target audience wouldn’t do so on their handlebars. Which is practically the only way to control the non-Pro AIRHUB. As such, it’s a bit less appealing to those of us that use bike computers from Garmin, Wahoo, etc… If the company had integration via a Garmin Connect IQ app tied to structured workouts, or had integration to the Wahoo BOLT natively, those would be incredibly appealing. To me though, it’s mostly about price and simplicity. The Pro model is cheaper, and frankly easier to use and understand. I know it’s going to do exactly what I expect it to when I toggle that switch. However, price overall is still an issue, just as it was with the original model. At $1000, it’s largely out of range of what most will spend. The company says it’s basically just a volumes issue for them. Being a smaller company they just aren’t producing the numbers needed to get manufacturing costs lower. Personally, I think this product would explode in popularity if it could reach the $499-$699 price range. That makes it something I’d very much consider, and I suspect something that coaches/teams would also consider having in their stable for certain athletes to ride. None of which takes away from the product – it’s well executed and simply does exactly what it claims to do. Sometimes, simpler might just be better. I was having a conversation about this sort of device with someone the other day. If it connected to your Garmin or Phone, and you could use it to control the resistance based on some kind of TrainerRoad (or similar) software, that out you in your target wattage. That way, you could ride outside, but still be getting in a decent workout. Would be ideal for me with my commute! As it happens, they’ve gone the complete other way by the look of it, which is a shame. Yup, what you describe though is what the non-Pro variant does (connects to a phone). See the link in the first paragraph for my post of that from last year. It would be like erg mode outside! I read this article as this version was replacing the non-pro version. 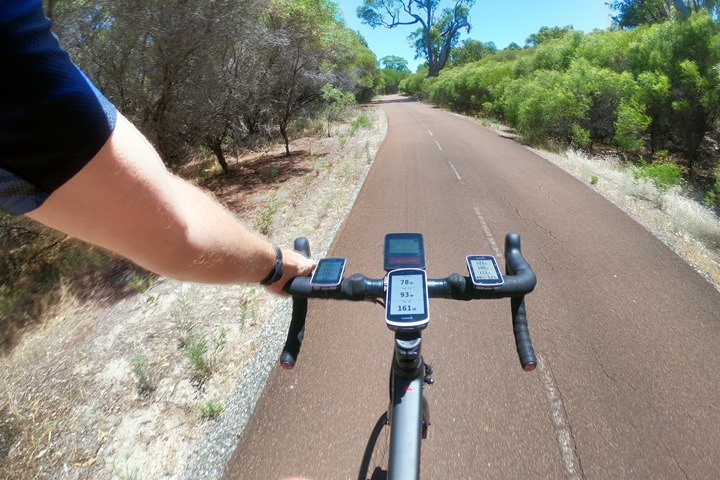 Can the non-pro be controlled from a Garmin Edge using the Trainer FEC profile? Eg, could I create a workout, and it the airhub controls the resistance accordingly? No FE-C support unfortunately. I agree that’s definitely an interesting approach though. The perfect solution would be an ebike integration. In a group ride you could always stay in GA1, if the group is to slow in the flat it would brake. If the group is way to fast in the mountains the motor could assist. The technology is already there many bikes have recuperation, they only would need a powermeter and a smart connected software. I just don’t get why it is beneficial to add more resistance for an ebike. It would just eat into your range and speed which for ebikes is what you trying to maximize upon. Essentially this is a training tool for your legs and cardiovascular system although with its price and benefits it must be a very small niche market at best. I’m surprised it doesn’t even act as a dynamo and charge a battery or phone. There is too much of a weight penalty and practical integration issues (break cutouts etc) if you start to put batteries and regen into the Hub. We had the goal of helping athletes improve their Training regardless of their Terrain or Training partners. To meet this goal we had to keep the system lightweight and easily removed/attached from a racing bicycle. Another enjoyable, interesting read thanks Ray. The second scenario is less obvious, but more useful depending on where you life. Fortunately I am one of those slow people others need this gadget for… Finally a piece of bike tech I really don’t need!!! Personally, I’d rather buy a smart trainer at that price and do my structured work inside when I don’t have people to ride with. But that could just be me. Is this road bike only? I could use something like this on the mtn bike. I have no trouble getting watts up on flats and inclines on the mtn bike but technical downhills are about maintaining intense focus just to stay upright…having some additional auto braking in that scenario would be welcome. Interesting idea. 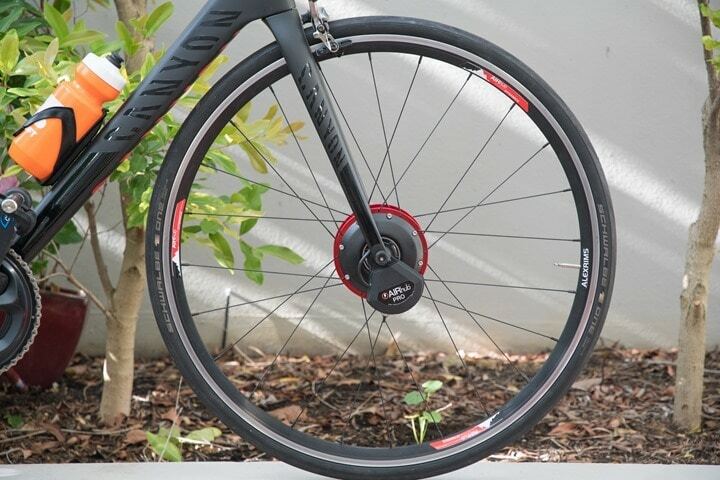 I wonder how this wheel makes the bike behave when braking/cornering. With the extra forces being applied by the hub, I wonder if the handing would be more difficult rather than easier from reduced speed. I was on a wet road ride this morning (starting to like Ray’s thinking to go to Australia), and it took everything I had to keep the bike upright (back wheel slipped out a few times, but stayed safe). I can’t imagine what it might have been like if there was an invisible brake on the front wheel, potentially causing both wheels to lose traction and me to wipe out. No the wheel will not cause you to slip on wet corners. It is magnetic resistance so it tracks with the speed, if you were to get a sudden slippage the resistance would instantly drop to zero as the wheel has stopped moving (skidding). The magnitude of resistance is about 30J per second (30w.) The KE of a bike at 32kmh is about 3100J. Therefor the AIRhub can only apply around 1% braking force, it will not be the cause of losing traction in any situation. Could a non-core scenario be where you use it for steep-ish downhills? i.e. when I’m at the limit of my gears and am going 60kph downhill, I can work another 120W harder? They should sell a cheaper version without any electronics that looks identical to the real one so you can front to your friends and say you had the resistance cranked all the way up when they legitimately smoke you. The AirHub Facade. A perfect example of a solution for a non-existing problem. I agree. You could buy a beach cruiser with a rack and add plenty of weight to it for half the price of this thing if you just want to go slower. If you’re not fast on a bike, you wouldn’t get it. I’ve been considering getting my girlfriend an e-bike, so we can ride together. But a good e-bike is $$$. I’d also of course like for her to have a fun lightweight non e-bike. More $$$. If, for $1000, I can get a workout while she gets a fun lightweight bike, it’s a win/win for us and a couple grand savings. And I get a new gadget to boot. Of course the other option is to get her a front wheel with a hub motor. But that’s complicated, requires charging, and, while I like gadgets she doesn’t and she’d rather not deal with them. So yes, I think this is a wonderful idea. I am a little concerned about the build quality based on the video. What was that at the :40 mark? Im not sure if saving a third of the price is worth the omission of half the features of the original AirHub. Options like cDA and HR-mode are definitely appealing for early base building and TT training. I’d rather wait for a drop in price of the Pro version or better connectivity/integration on the ‘smarter’ AirHub. Yes, with the original version, the ability to go into ERG (power) or ERG (HR) mode on your local roads seems like a pretty cool feature. With this version, it seems like you would be better off just slapping on some really slow tires. Or wearing baggy clothing. For $1,000, you should at least get a handlebar-mounted lever where you can dial in a range of resistance from None to Max. Tbh adding resistance to a bike is a bit like drinking coffee. Sure, you can have instant coffee, but it tastes terrible and you will probably contract some sort of disease. Or you can spend a little extra and get the best coffee that’s worth it every time. For Resistance buying a set of heavy tires and letting the air our makes it hard, but it’s sluggish terrible instant coffee hard. AIRhub, paired with good rubber, keeps the rotational mass low, maintains the nice windup, has a great road feel, tracks with speed, stays super subtle and is Colombian single origin syrupy goodness. This is why we built it, the resistance is so subtle you accidentally get better with every ride, kinda like an altitude effect. seems like a expensive solution in search of a problem. For years, folks have accomplished the same thing by using big, heavy, durable, inexpensive, slow-rolling training tires for added resistance. Didn’t Bianchi or Colnago or someone get killed on social media recently because they featured an e-bike to help the wife keep up with her husband and it was viewed as sexist and the husband was a d-bag for not waiting for his wife. Interesting that this product serves to solve the same problem but in reverse- slowing down the faster rider. Personally I think both products can serve a very genuine purpose. I guess it all boils down to how people perceived the marketing message. Their specific issue is that they used a women as the implied lesser athlete. Had they used two males, they’d probably gotten away mostly unscathed (interestingly, had they used two women, I think they’d have still gotten in hot water). Which is funny, because as you point out, the problem and solutions are very real for many couples. So regardless of whether one wants to make Partner A faster, or Partner B slower, it’s still the same net outcome: Couple gets to ride together. My old technique was a burley trailer and my 70 pound dog. No off switch with her though! Ray, What about rollers? Do you think there are any that could handle it without the band breaking? Yeah I know a few people that would possibly be interested for ~$500, but for $1000 it is definitely out of the range they would be willing to spend. They would be doing like what you said and riding with their wives. Sounds like this would work as a brake on long technical downhills — I could’ve used something like this to keep from melting my brakes coming down Alpe d’Huez. It’s too limited in either the pro-but-not-pro and the not-pro-but-pro versions. It just ain’t delivering the goods for its price. As Ray said, get the volume up and the price could come down. So, then instead of lowering the price and hope customers came (IMHO unlikely, backed up by the comments so far), why not ADD a few incremental features? In particular, the resistance could be provided by a motor. This motor would implement a TRUE erg mode for the bike. On an uphill it would add watts (say 100-150 watts max) to maintain constant watts on the pedals, on a downhill it would add resistance (say 300-500 watts max) to maintain the same watts from the pedals, and on a flat it would add or subtract a few watts based on speed, wind, etc. In other words, make it a pedal-assisted Copenhagen wheel with a resistance function. People would pay more for these features, and I believe the small incremental mfg cost would be offset by the economies of scale. Not sure if anything can address the issues of a front-powered wheel, although at the modest power add/subtract I’m discussing I’m hoping (without evidence) that it won’t be a problem. You *might* be able to detect a front wheel skid at the motor and moderate resistance to adapt. Again, not sure if the control loop is practical. Great idea, and something we looked into at the beginning. The biggest killer is weight. The Copenhagen wheel weighs in at 7.6kg. Most racing bikes (our target market) barely weight in over 8kg. One of our goals was to get the weight down as much as possible. We achieved a 1.5kg hub with some neat (but expensive) engineering. i wish it were lighter still, but no luck. The difficult thing about physics is that all the good stuff has rather immovable limits to energy densities and mass. For example, if you want to create X amount of Torque at Y rpm you need Z mass of Electrical Steel. Same goes for the Energy densities of batteries. I think i will take quite a while before a product like the Copenhagen wheel comes down to a reasonable weight level for every day application. Thanks, Michael. I understand how hard it is to figure out the features of a product. What I’m saying is that I’d be willing to buy a second bike (commuting, riding with slow friends, doing training rides where erg mode makes sense). This 2nd bike could weigh 30-40 pounds w/batteries. Note it could also be for rides with *fast* friends. With enough of a battery, it’d be possible to keep up with faster riders on light weight road bikes. I don’t think I’m a “market of one” here. I bet if you asked a bunch of random bicyclists if such a beast would be a good 2nd bike they’d say yes. (I’ve asked a few of my friends.) A $1500-$2500 price target (depending on features) would seem to hit a large target market, large enough to get some economies of scale. I’d even be willing to put a deposit down on such a bike! p.s. If it were a dedicated 2nd bike product, you could do everything on the rear hub — getting rid of the stability issues, and perhaps even making something look less odd. I can add 30 watts of resistance with knobby tires and a loose windbreaker and another 20 Watts if setup my brakes to rub basically for free. I guess I am missing something. The comments about just add weight miss the biggest difference. Added weight or rubbing brakes has more of an effect at slower speeds where this increases with speed much like a dumb indoor trainer. As Ray points out there is no real purpose for a solo road ride. 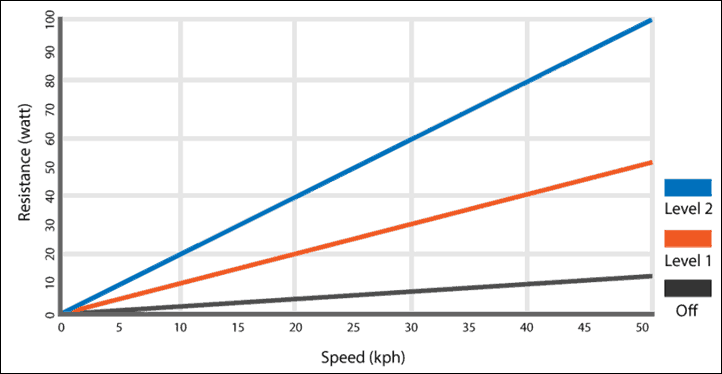 But if you have to be speed limited on a path, this would only add 20-40W @20kph/12mph which doesn’t seem like enough. I’ve thought of something like this for riding with my wife’s family, kids and dogs don’t make for a hard workout. Endurance fatigue tracks exponentially. So for every 10% increase in power output the difficulty of your ride will double. Adding 20 – 30w is more than enough for most people to significantly improve the difficulty of their ride, or reduce training time. Bikecalculator.com suggests that it would require 70W to pedal flat @12mph (bike path speed). Airhub would bring that up to 110W which would be equivalent to 15mph. If you would normally ride 20+mph then you would be pushing 250-300W. This would need to add 150-200W @12mph to be a real simulation. It’s only the lower speed that is a problem. This. I love the idea and could see myself buying one to get a better workout while I pay it forward helping newer cyclists get out and improve their fitness (just like some cyclists did for me when I was starting out). 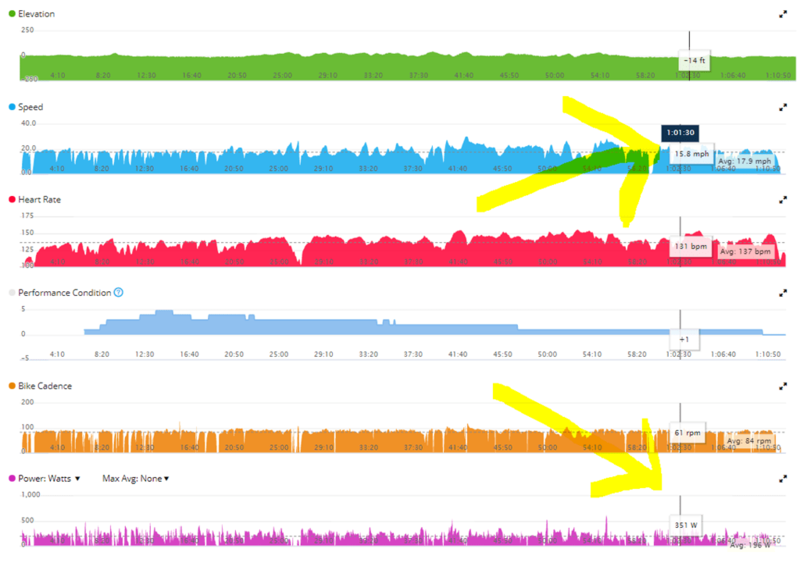 But I checked some stats on two recent rides: A ride with new cyclist friends and the wife averaged 12.7 mph, and 76w (139w normalized power thanks to a few intervals mixed in). A ride on the same route with a better cyclist friend averaged 18mph @163w (199w NP). For $1000+ I might be able to get a used mountain bike or fat tire bike that would provide similar resistance… At the advertised resistance settings, perhaps it’s an easier sell to the good cyclist who wants to handicap him/herself further while on training rides with people of similar fitness, which will help push them to that 1-2% improvement (though one could do that without spending money, or actually by spending less money on a heavier/less aero bike and gear). Could there ever be a scenario where the electromagnetic brake causes the front wheel to stop unexpectedly? That is what would concern me about this setup. Other than that, I think it is a wonderful idea. 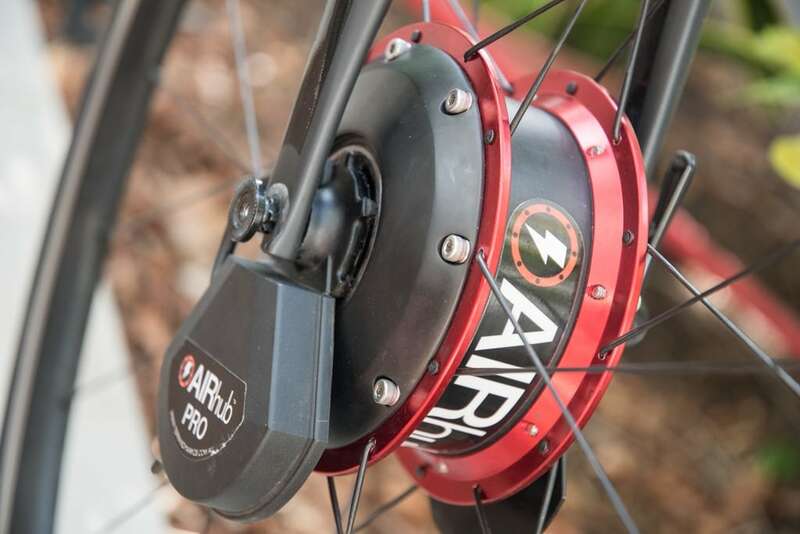 Ray, did you find the Pro version quieter than the original AirHub? Is there much of a difference? Best I can tell, the Pro version is silent. Looks like it is rim brake only? 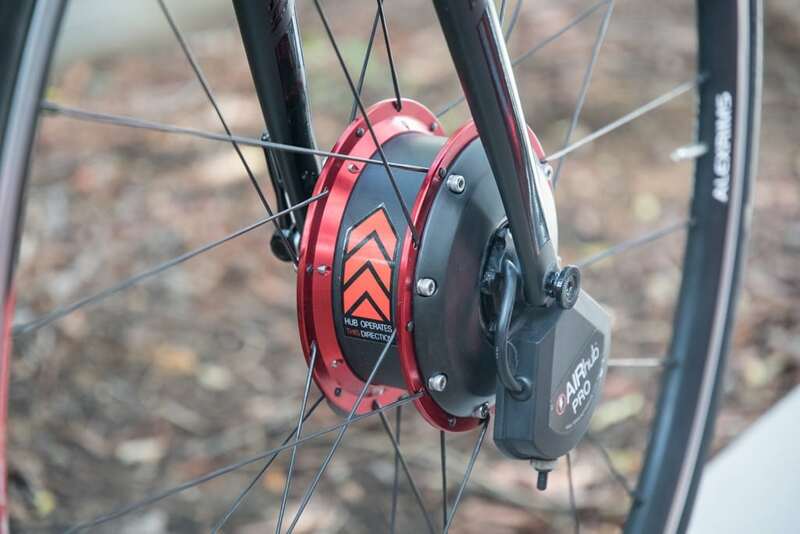 No support for disc brakes or through axle? Honestly, I think this is an amazing idea. I now live in a generally flat area at sea level, whereas previously I had local access to high mountains. This is the perfect solution for those people who struggle to get a decent training ride in at speeds which match the terrain, traffic or weather conditions. Congratulations to the inventors.